Much as I enjoy his opinion page, the editor of the Wall Street Journal is utterly misguided to suggest Internetizens shouldn't expect news to be free. And so is his boss. "Free" is the Internet way, as it was long before the wallowing conglomerates ever got involved. I understand the need of newspapers to make money but they're going to have to find ways other than charging to enter their websites. It wasn't too long ago after all that the New York Times, among others, tried that with miserable results. No, the availability of free, in-depth information easily accessed through Google or RSS feeds is creating a new, more open kind of society. It's doing what free television (or in ancient times, free access to the communal campfire) used to do, only more so. I believe it is time for the papers to close down the presses, stop ordering newsprint, and get all the way on board with this epic sea change. Sorry Mr. Murdoch, but I've got news: We refuse to go backwards. Yo Jim. I love reading your blog, despite almost never agreeing with you. Not long ago, I resolved to comment the next time you and I agree. Here it is. In a world, where almost every entity greater than the individual (including most churches) wants to make a tool of the individual, it's good to see one big tool wielder of the past have to change or die. You almost never agree with me? But Dan, I'm a fellow Michigander (among other things)! Maybe you should start a blog and then I'll come on an post when I agree with you, too. Power to the people! Death to The Machine! Found your blog on Facebook and have been reading through your RSS feed. This is a great post, but it's sad to see this happening to them, but they seem to be completely clueless as to the nature of the problem: their mindset. They forget that they were always about content and that paper was just the easiest tool for distributing that content. They seem utterly incapable of seeing a future without paper - and the huge overhead in presses and transportation. Not to mention that this attachment to paper also ties them to a publication schedule that makes their "news" old before it even gets off the press. Amen to that Lowell, and you would know better than most. 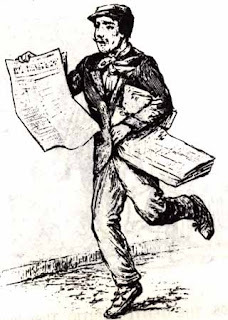 As I said in my December 10th post, reading the morning paper used to be a daily ritual for the great mass of people -- but that ritual has been replaced by reading the news online. Even my 70+ Mom and Dad have made that change; surely the journalists (or the wealthy plutocrats that run them) can stand to do the same. Be on the look out for my blog, Jim. If all goes well, I'll begin late this summer. Just remember that you told me once that I had a talent for trivializing anything. Politicians, Religions, Big Business, Big Media all make tools out of people who could become forces if they just used their imaginations. That will be the gist of my message. Awww... I have to wait till late summer?? I'll look forward to it, Dan! But beware: The power elites will probably shut you down on a trumped up charge if you don't tow the party line!